September is just around the corner, and that means the return of the Classical Music Agenda. For those who are new around here, this is a regular post in which I pick the ten performances I think are the highlights of the month here in Washington. The rest of the calendar will scroll through the sidebar as the month goes by. Washington National Opera's production of Wagner's Tristan und Isolde was one of my Top Picks for the Season in Washington. This staging, borrowed from Opera Australia, will have just five performances (September 15 to 27) in the Kennedy Center Opera House (see Thomas May's fine program notes on the opera). It is true that the voice of American soprano Deborah Voigt has sadly lost some of its luster in the last few years, and her Tristan will be Ian Storey, who canceled out of Götterdämmerung and Ariadne auf Naxos a few years ago and was not great in WNO's 2008 Der Fliegende Holländer. I hope for great things in this production because of the chance that music director Philippe Auguin and his orchestra will work the same magic heard in the 2009 Götterdämmerung. Another important player in that performance, mezzo-soprano Elizabeth Bishop, will sing Brangäne. The other opera we plan to hear is Washington Concert Opera's performance of Verdi's I Masnadieri (September 22, 6 pm) at GWU's Lisner Auditorium. Verdi himself conducted the premiere of this opera, in 1847 in London (with none other than Jenny Lind starring as Amalia), one of the composer's less appreciated early operas to round out the Verdi bicentenary. It will feature another chance to hear soprano Lisette Oropesa as Amalia, who would have costarred with René Barbera until he canceled, to be replaced by tenor Russell Thomas. The story, based on Schiller's Die Räuber, concerns two brothers, the older of whom is driven away from the woman he loves to a life of crime with a band of robbers. The libretto by Andrea Maffei, most scholars agree, is not one of the best that Verdi chose. The Baltimore Symphony Orchestra will present the world American premiere of the new saxophone concerto by John Adams (September 20 and 22 in Baltimore, September 21 at Strathmore). 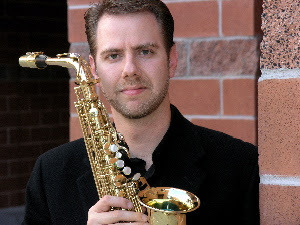 Saxophonist Tim McAllister (pictured) will do the honors as soloist, and Marin Alsop will also conduct Rimsky-Korsakov's Scheherazade and Tchaikovsky's 1812 Overture (with the U.S. Navy Band Sea Chanters Chorus). Other than the Adams, it is bland programming indeed, which has been my main complaint about the BSO season for the last few years. Get your fill of the area's main contemporary music ensembles, beginning with the VERGE Ensemble in a free concert at the Smithsonian American Art Museum (September 8). All I can say about the program so far is that "pianist Laurie Hudicek, flutist David Whiteside, violinist Lina Bahn, and cellist Tobias Werner [will] trace the lyrical and folk underpinnings of American classical music." Inscape Chamber Orchestra opens its season with a concert in the Mansion at Strathmore (September 12), playing music by Ravel, Justin Boyer, Nathan Lincoln-DeCusatis, and Joseph Hallman (a piece called, irresistibly, imagined landscapes : six Lovecraftian elsewheres). Finally, the Great Noise Ensemble kicks off the New Music Series at the Atlas Performing Arts Center (September 21) for its second season in residence there. The program will consist entirely of newly commissioned pieces inspired by the Beatles album Sergeant Pepper’s Lonely Hearts Club Band, by composers Matt Marks, Joshua Bornfield, Daniel Felsenfeld, and many more. Washington's early music offerings are just as varied as its new music ones, and this month you can catch the first concert of the season for the Washington Bach Consort (September 22), a program of mostly Italian music featuring soprano Jennifer Ellis Kampani at National Presbyterian Church. If you wanted to hear Vivaldi's famous Gloria again, this is your concert, but fortunately it will also feature less commonly heard pieces by Bach, Pergolesi, and Francesco Bartolomeo Conti. For something a little earlier, there is an interesting program called Map of the World: Music from 13th- and 15th-Century Spain from the Folger Consort (September 27 to 29), in the beautiful theater of the Folger Shakespeare Library. The selection of music includes the Cantigas d'amigo by Martim Codax, and a mass by Juan Cornago. The quartet of singers is headlined by tenor Aaron Sheehan, an Ionarts favorite, and soprano Emily Noël, who is another fine singer we first discovered thanks to Timothy Nelson and his Ignoti Dei company. 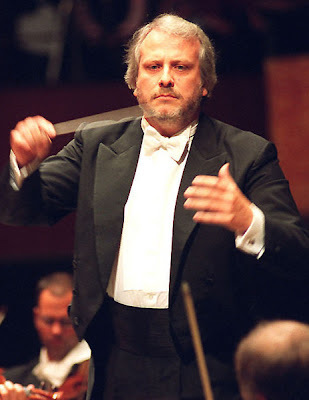 The National Symphony Orchestra Season Opening Ball Concert (September 29) is always a big production, generally more noteworthy for its red-carpet qualities than the music. Christoph Eschenbach, about to embark on his fourth season at the helm of the NSO, has made an effort in recent years to give some more weight to this event, but this year is once again mostly about glitz. Cellist Yo-Yo Ma is trotted out for the saccharine Rococo-Variations by Tchaikovsky, paired with the same composer's Romeo and Juliet. On the second half, a Pops-worthy Carmen Suite No. 2, and then just the last movement of Saint-Saëns's Organ-Symphony. For the latter, a piece that is only minimally about the organ part at all, the NSO turns to Cameron Carpenter as soloist, hopefully with white shoes and rhinestone cape. This is probably not an evening for anyone who cares about music and does not also happen to have a lot of money to donate to the NSO. The soundtracks from Peter Jackson's Lord of the Rings trilogy, composed by Howard Shore, are not great music, but like the best soundtracks this music increases the cinematic impact of the scenes it accompanies without drawing attention to itself. The Filene Center at Wolf Trap has now hosted an entire cycle of the three movies, screened with a live performance of the music cued to the film. From our experiences of The Two Towers (2009) and The Return of the King (2010), I can say that anyone who enjoyed these movies will get a thrill out of these performances. 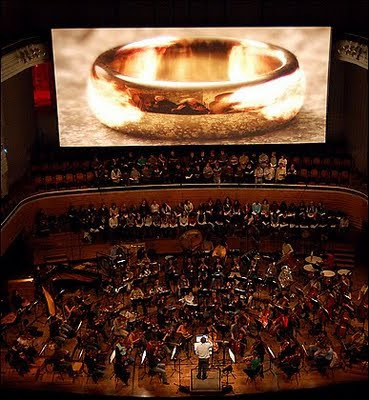 This year, Wolf Trap begins the trilogy anew this year with two performances of Fellowship of the Ring (September 6 and 7), again featuring the City Choir of Washington. See the complete September calendar after the jump.